Located in a cavernous, former auto repair garage, tucked away on tiny Minna Street between 1st and 2nd and Mission and Howard Streets, is Anchor and Hope Fish House. They offer 15 craft beer taps and a hand pump, from which they dispense beers from top local breweries and other respected American craft beermakers. They also pour Belgians and other fine foreign beers often in their specific proper glassware. Some of the taps rotate, so they try to provide a relatively current list on their website. Anchor and Hope also features an impressive bottle list that runs 80 or so deep and features a wide variety of styles. There is no large corporate beer to be found. The room is large, with a stylish modern industrial feel. You can sit at the bar and order food off a happy hour app menu or full lunch and dinner menus. Exit BART through the exit labeled B2, to the south side of Market Street. Walk to 2nd Street and turn left. Continue south across Mission Street to little Minna Street. 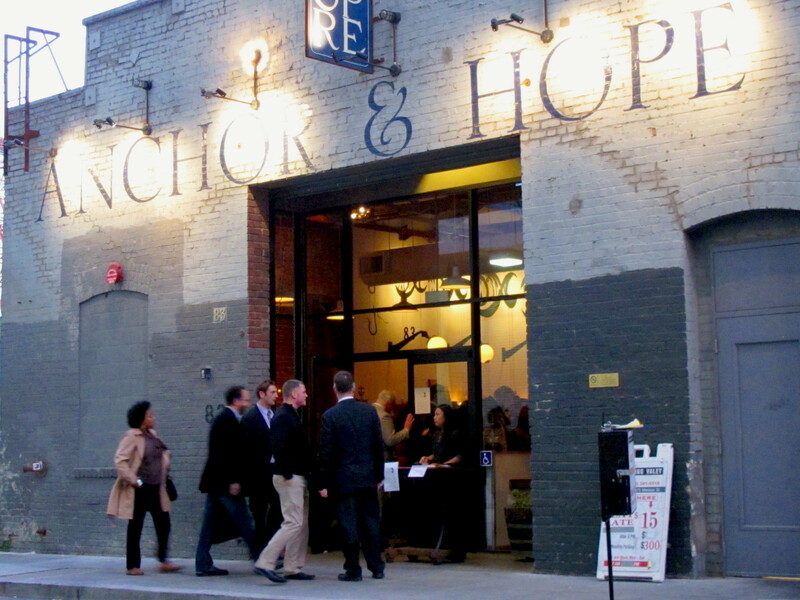 Turn left on Minna, and find Anchor and Hope on the right side of the street. Great little place with excellent food and an awesome beer list. Plenty of high quality beers on tap. Can get loud and crowded but you’ll be missing out if you don’t hit this place up. Reservations for two or more is probably a wise idea.